Discharged from hospital sometime later, John asked a Coach to help him return to athletics. Despite lingering health issues and living in one of the most isolated cities in the World, he went on to win State and National titles, retiring in 1956. He then had a family and was working full time as a gardener. Perth hosted the 1962 British Empire & Commonwealth Games, John watched the athletes preparing and the urge to start running again returned, he was now aged 43 and wondered if he could get fit enough to make the Western Australian State marathon team for the Australian Championships. The Trial was the State 15 Mile Championships being held over part of the Games course, normally five would be selected, he finished a delighted fifth in 1.24min ahead of much younger men. Only four were subsequently selected. Some of the Selectors felt he was too old and would not even include him when one of the team subsequently got injured and John had won the 1956 State marathon title! The War had deprived him of ever competing in the Olympics and now age discrimination prevented him from running in these Games in his adopted city. John was now coaching at the Club he founded, Canning Districts AC. Some top athletes he nurtured were Commonwealth Games hurdler Jenny Watson and top Junior Kerry O’Connell. 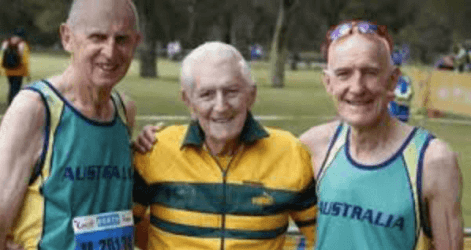 The photo above taken after the M70 Cross-Country during the WMA Championships in Perth shows John with silver medallist Jim Langford who he coached as a Junior, and the winner Don Mathewson who said Gilmour was his hero. A new world was now opening up for older athletes – Veteran (Masters) Athletics and the growth in marathon running clubs. It was through meeting a veteran athlete, Cliff Bould, at one of these clubs that John heard of Masters athletics and went with Cliff to compete in the 1971 USA Masters Track & Field Championships. Aged 51 he built his training up to 160km per week. At the US Masters in San Diego in July 1971, organised by the doyenne of Masters Athletics, David Pain, competition was then in 10-year age groups, John won the M50 10,000m on the first evening in 35.42sec; the 5,000m the following day in 17.07sec, both were M50 World Records. He had not trained specifically for the marathon but was persuaded to enter and run the next day, finishing a tired 4th in 3.18.14sec. Voted M50 Athlete of the Championships, his first ever World Records and the recognition and adulation of his incredible achievements, the man who had suffered so much had now found a sport that was to take him around the World, attract a huge international following and be held in awe by the young athletes he coached and anyone who ever had the privilege to meet him. He came from a humble background and suffered badly from bronchitis as a child. Born in Scotland in a farming community, the family emigrated to an under populated part of Western Australia under a Group Settlement Scheme when he was aged 4. Living conditions at the isolated Settlement were primitive and his family struggled. After his family moved to the Perth suburbs John had to walk some miles over sand dunes to school. He developed a love of sport particularly athletics and soccer, he fondly remembered the encouragement he got from his Physical Education Teacher. At the US Masters Championships where contact was made with so many other athletes, John was invited to join the US Masters team travelling to a Masters International Championships in Cologne and visiting other Europe countries in August 1972. It was the start of his long and nonpareil international career, during which he had the supreme courage to tackle his demons by returning to run in Championships in both Singapore and Japan despite such memories. He did retire briefly in 2005 but on learning that the WMA Championships was coming to Perth in 2016, to the city in which he had founded the first Athletic Club south of the Swan river in 1950; where he founded Western Australian Marathon Club in 1970 and was a founding member of the WA Veterans Athletics Club (now Masters Athletics WA) in 1974; where so many athletes he coached, active and not now competing, lived and trained and his feats and name are household vocabulary, that competitive urge came back. 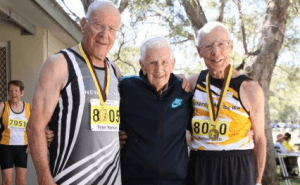 On 5 November the 97 year old was one of nine men who started in the M85+ 1500m. As he circled the track, athletes, Officials and spectators stood and applauded his every step. He won the M95 WMA title in 19.35.19sec, it was his final race; he had earlier won the 800m. In his second book “Lasting the Distance. Memoirs of John Gilmore – World Champion Runner” written by P. D. Collier, John estimates that during his athletic career he covered a distance equivalent to two laps of the world. From 1938 he competed in over 1,000 races including 21 marathons. Set over 100 Veteran/Masters World Age Group records, some of which stood for over 15 years and won over 50 Australian Veteran titles. Australia would bestow him every possible Honour and Award. He carried the Sydney 2000 Olympic Torch through his local area. Our sport brought much pleasure to this man’s life, but his inspiration, modesty and will power leaves us with an enduring memory. He passed away peacefully whilst undergoing heart surgery on 1 August aged 99. Aged 53 he set a new M50 World 10,000m Record in 33.05sec in Helsinki going on to break the 5,000m WR winning in 16.05sec on a cinder track in Cologne. He also won the 10,000m in 33.20sec. It was agreed in Cologne that a World Masters Track & Field Meet should be established. The Canadian Masters offered to host in 1975. John won the M55 3000m by over 50sec in a WR 9.28sec in Toronto and retained his World Veterans 5000m in 17.02. Competition was now in 5-year age categories. Had he entered the 800 and 1500m his times would have ensured him the titles. Voted 1975 Best M55 Masters Athlete of the Year by US Track & Field News for his five gold medals from two international Meetings, Toronto and the Pre-Toronto Meet in White Plains, USA where he won the 1500m (4.41.0sec), 5,000 (16.25) and 10,000 (35.04.3). Back in Perth he lowered his own 3000m time to 9.22.8sec, and to 9.21.0 on 11/2/76 aged 57 again in Perth. He won the State Marathon Championships in 2.42.47 aged 57. Following on from Cologne and the formation of the World Association of Veteran Athletes (WAVA), the next biennial Track & Field Championships were held in Gothenburg, Sweden, from 8-13 August attracting over 2,500 competitors. In a preview by Professor Roger Ruth from the University of Victoria, Canada and himself a pole vault competitor, John did not even feature, the Professor concentrated largely on the many Olympians that had entered. It was in Gothenburg that John became an icon of the sport. He faced 29 men in the 800m, winning in 2.14.5sec, taking the 1500 /5000 and finishing 2nd in the marathon. He ran a marathon in 2.38.19 aged 59 when the Australian qualifying time for the 1980 Los Angeles Olympics was 2.40min. WMA Track & Field Championships were in Hannover, John’s reputation was now well established, he won the M60 800m in 2.19.3sec a World Record; the 1500 by a clear 16sec in a WR 4.32.5sec after running both semis. He also took the 5,000 (16.54.9), 10,000m (35.07.7sec) both again WRs, 10km cross-country and the marathon in 2.52.28 a World M60 Best. No other competitor has ever achieved this. He was voted Athlete of the Championships. Entries exceeded 3,400 from 57 nations. He was to repeat the track feat two years later at the Championships in Christchurch. His cross-country wins were all the more remarkable as he was hampered by his damaged eyesight. He concluded 1981 with a marathon World M60 Best time of 2.41.07sec. In the mid-Eighties despite having been involved in a serious road accident and the many setbacks that his abused body had been through, incredibly he still carried on with a heavy training mileage, breaking World Age Category records and World Bests on the road. He lapped the entire field in the M65 10,000m at the WMA Championships in Rome 1985 to win in 36.39sec, set a WR in the 5000m 17.25.30sec early morning before going on to break the M65 1500m WR later that evening running 4.49.16sec. Two World Records in one day! He looked forward to moving into the M70 group with relish, quickly re-writing the record book at the WMA Championships in Eugene where his 1500 (5.09.73sec), 5000m (18.46.6sec) were new World Records and establishing himself as the first human aged over 70 to run an accurately measured 10,000m in under 40 minutes – 38.49.25sec. Imbued with happy memories of the US Masters and a perfectly organised Championships; he admitted that this was one of his most memorable WMA Championships as he returned home with 5 gold and one silver (800) medal. He was to suffer a rare defeat over 10,000m in Turku, his first for half a century, when conceding victory to the American Utes who ran under the existing M70 record, but it is noted that World titles generally go to the youngest in the older age categories, Gilmour was now heading towards 73. He still came away with two gold medals, the 10km cross-country, where he was to suffer a bad fall and the 5,000m. In 1993 he would reclaim his M70 World 5000/10000m Age Records, now aged 74. Miyazaki, Japan, hosted the world’s largest international Track & Field Championships from 7-17 October, attracting 12,000-plus competitors from 91 nations, a Guinness Book of Records. He was now well over age 74 but he went on to win one of his hardest 10,000m in 42.20sec by a clear 5sec. After suffering a heavy fall early in the 5,000m race, he amazingly fought back to finish 3rd, he got another bronze medal in the 1500m and won the M70 cross-country. What a performance. More prone to injuries, his preparations seriously hampered, he was only able to run in the M75 cross-country in Durban where he finished 2nd aged 78. The WMA Championships were to return to Australia and he could not resist the temptation to build up his training again only to receive yet another serious setback whilst our training for Brisbane 2001. A large dog had chased him jumping on his back sending him crashing to the ground and fracturing two ribs, that was just six weeks before the Championships. Undaunted, and still recovering from his injuries, he missed out on a medal in the 5,000 to Emil Pauwels of Belgium by the narrowest of margins – 24.59.40sec to 25.00.81(!) in the 14- strong M85 field. The first time he had ever failed to get a medal at that distance. He did however get the silver medal behind Pauwels in the 800m.